Anbee Backpack for Parrot Bebop 2 FPV / Bebop 2 Power FPV / Bebop 2 Adventurer Drone. Compatible with Parrot Bebop 2 FPV series drone with a small controller and FPV goggles. Not fits for Parrot Bebop 2 drone and Skycontroller. Fits Latest Skycontroller 2 Remote + VR Goggles. 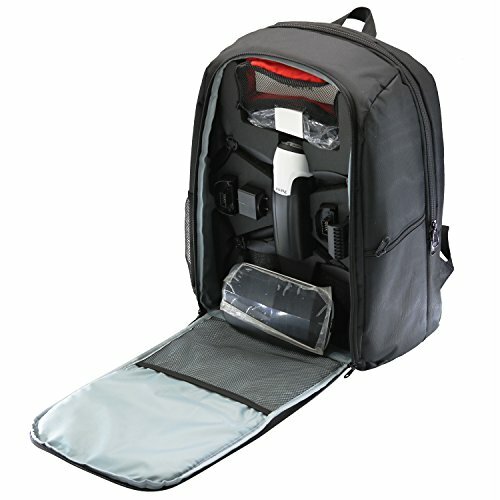 Storage available for: 1x Drone, 1x Controller, 1x Goggles, 1x Phone holder, 3x Batteries, 4x Propellers, 1x Battery Charger, 1x Laptop/Tablet (14-15") and some other accessories... Custom cut EVA foam interior, it can be taken out and be used as a regular backpack. Also fits other small sized RC quadcopters. Material: Nylon + EVA Foam with high-class zipper. Backpack demesions: 16.5 x 13 x 6.5 inches (42*33*16.5 cm), Net Weight: 2.2lb (1kg). Note: Parrot Bebop 2 FPV Drone and it's accessories does not included.